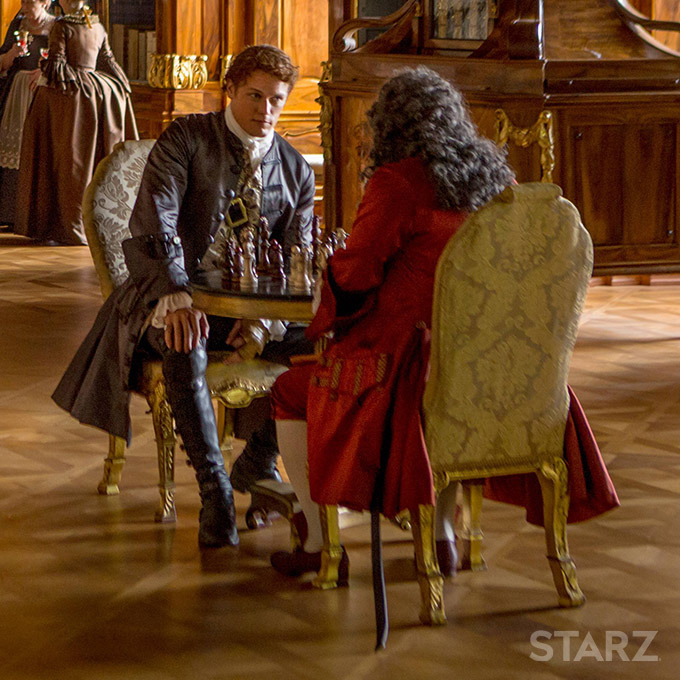 This episode will focus on strategic moves Jamie (and company) will make to undermine the Prince and thwart his plan, which is equitable to playing chess. What better analogy than that of chess where one play has to out maneuver the other to win! I believe this refers to several characters and scenes we will see in this episode. JAMIE. With the rebellion being plotted in a brothel, some of the strategic moves are being made over a chessboard. 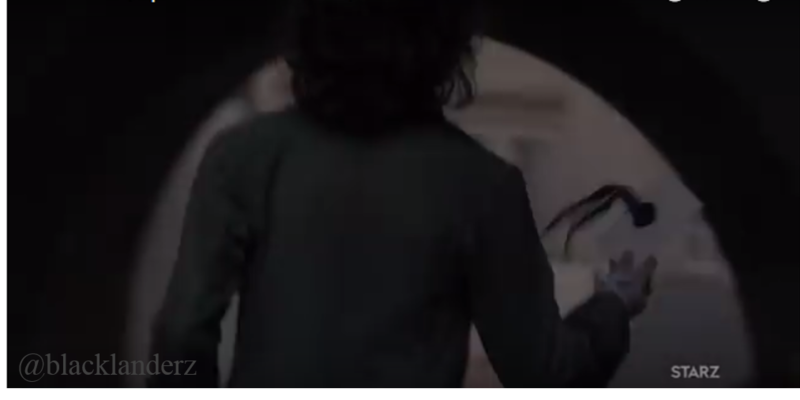 This is obvious when there are numerous shots of the board and moves being played in the preview clip of Jamie and Duverney, Minister of France, in Versailles. MASTER RAYMOND. Becomes more of friend and confidant to Claire. CLAIRE. She is not the ‘meek and obedient’ type and will not tolerate sitting around with other ladies, drinking tea and gossiping. 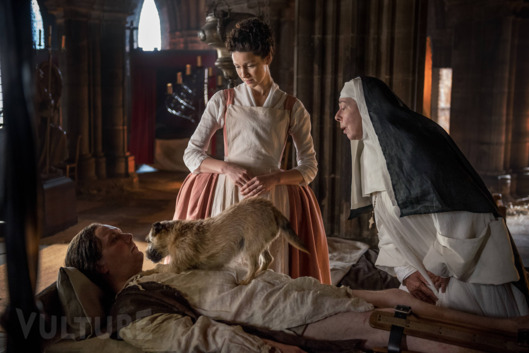 So, she will put her medical knowledge and healing skills to better use by working at a charity hospital, L’Hôpital des Anges, where we meet Mother Hildegarde de Gascogne and her medical assistant dog, Bouton. FERGUS. 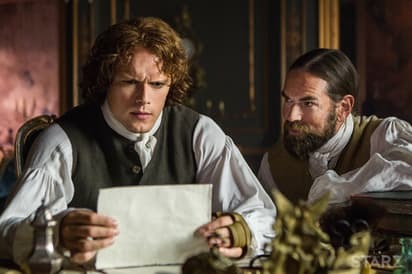 Jamie hires wee Fergus, who is a pickpocket because he needs information that he cannot get from the Prince. The type of information that comes in the form of letters – from the Prince’s father, wealthy Englishmen, or financiers. He is also small enough to dart in and out of places where people probably would not even notice he there. MOTHER HILDEGARDE DE GASCOGNE & BOUTON. She will play a part helping to decode the music, as well as other things. The above picture illustrates Bouton’s usefulness. 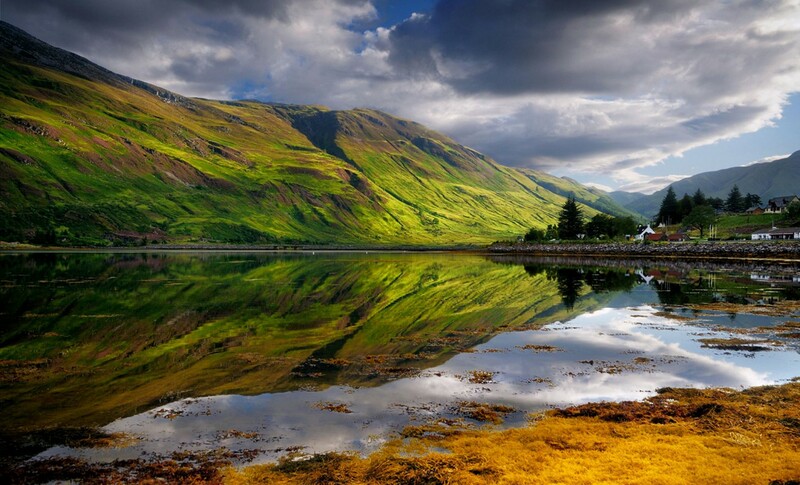 MURTAGH. There is more Murtagh! Being the godfather, he will watch over everyone and be in the thick of things. It will be interesting to see what other characters with useful occupations show up and how they are used. 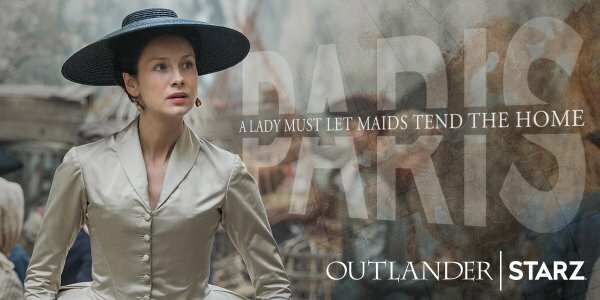 The entire first half of the season is full of deceptions, starting with Claire, Jamie and Murtagh’s cover story as to why they are even in Paris. However, with all of the new characters introduced last episode along with some returning characters from S1, it will be interested to see who else will deceive whom. 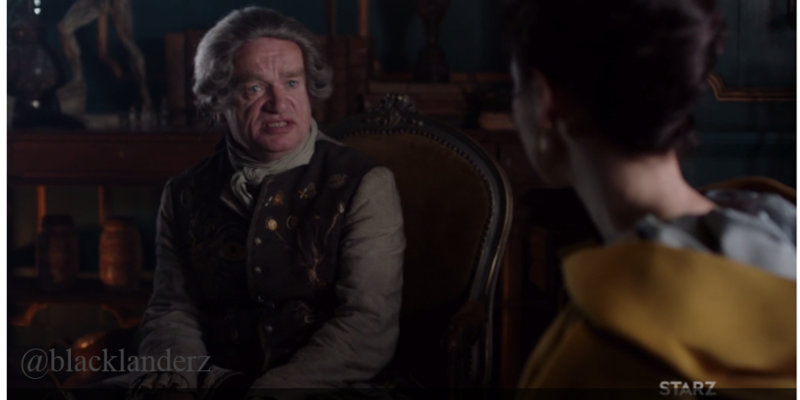 As Starz pointed out, it can be hard to tell those who have your back from those who want to stab you in it.